Axis bank is the third largest private sector bank in India with its headquarters in Mumbai. Axis bank offers a wide array of banking products including many deposit schemes to suit all your banking needs. The bank offers one of the best fixed term deposit schemes in India. You can open a fixed deposit with axis bank at any branch, if you have a savings account with Axis bank. You have to fill in the fixed deposit account opening form at the branch of your choice or can open a fixed deposit hassle free online from the comfort of your home or office. There are many fixed deposit schemes for Axis bank for various duration's including simple reinvestment fixed deposits with very competitive interest rates. You can open a FD with a minimum investment of Rs 10,000 and add more amounts in multiples of Re 1 afterwards. The minimum fixed term for the simple reinvestment fixed deposits is 6 months. Reinvestment Deposits: When you deposit an amount in the reinvestment fixed deposit scheme, at the end of each quarter the accrued interest will be invested with the principal amount and interest will be calculated on that total sum net of TDS (Tax Deducted Source). The minimum term for a reinvestment fixed deposit is six months. When you open a fixed deposit, you can opt for the facility of automatic rollover for both the principal amount and interest on maturity. There are two options in the Account Opening Document (AOD). Rollover only Principal: In this type of deposits, only the principal amount of your fixed deposit will be rolled over and the interest will be paid out or can be credited to the given account. Rollover Principal and Interest accrued: In this scheme both the principal amount and the accrued interest will be rolled over for your fixed deposit term with the interest rates offered on the maturity date. You can also make changes in the rollover terms of the deposits on or before the maturity date of the fixed deposit. You can change the tenure, maturity instructions, payment instructions, principal amount and the rollover schemes (You can change from the rollover of Principal scheme to rollover of Principal + Interest). Axis bank allows you to withdraw the fixed deposit amount only from the branch where the deposit is made. 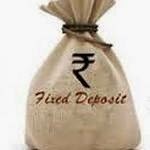 The period for your fixed deposits is considered in number of days. If your FD is for tenure of six months and above, the interest will be calculated on a quarterly basis. The interest rate on the rolled over amount is calculated every quarter. If the tenure is less than six months, interest is calculated at simple interest. If you withdraw the amount prematurely you will get the interest only at a rate applicable during the period of withdrawal. There will be a tax at source deduction as per the Income Tax regulations. Documentation: In order to open a fixed deposit, you must submit a valid photo identification card, a photograph and an introduction by any other bank or by an Axis Bank Savings Account holder for the last six months.